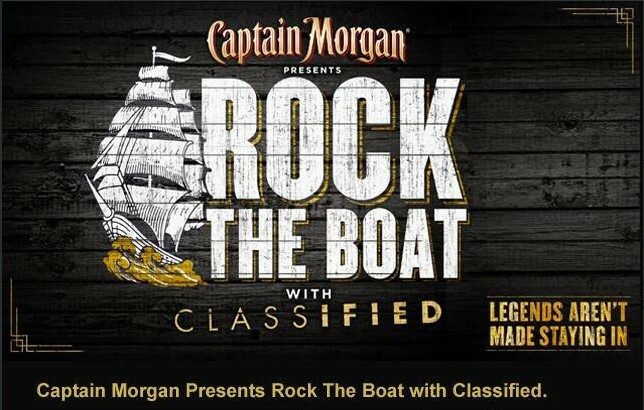 We’ve teamed up with Captain Morgan to give away FIVE pairs of tickets to Captain Morgan’s exclusive Rock the Boat party taking place at the Phoenix Concert Theatre on November 8th! The night will include a live performance by Juno-award winning artist, Classified, multiple interactive experiences, samplings of Captain & Cola… and so much more! For a chance to win a pair of tickets you must enter through our Facebook registration form. For a BONUS entry via Twitter, tweet “@BestofTorontoTV I want to win tickets to Rock the Boat with #CaptainMorgan #CaptainRocks http://on.fb.me/1cD4KBf“. Contest ends November 1st at 2:00pm. Best for GTA residents. No transportation provided. No cash value. Valid ID required, must be 19+ to attend.